← Take vitamins and stop wetting the bed! There must be something about the Queen that inspires the people to eat food. Special food, mind you – the sort that goes by the name ‘banquet’ and is accompanied by a souvenir menu. What is it about this woman that makes people – in particular the social elite – fall over themselves to attend a dinner event? This may be destined to remain a mystery, but I’m prepared to bet serious money when it was announced that Queen Elizabeth will visit Australia this coming October for CHOGM, certain people immediately started planning how to get themselves invited to the main dinner event. They can be fully confident that there will be one. These dinners don’t always require the Queen to actually attend. Back when Elizabeth was crowned in 1953, acting Prime Minister Sir Arthur Fadden wanted to do something special in far-away Canberra to mark her Coronation. 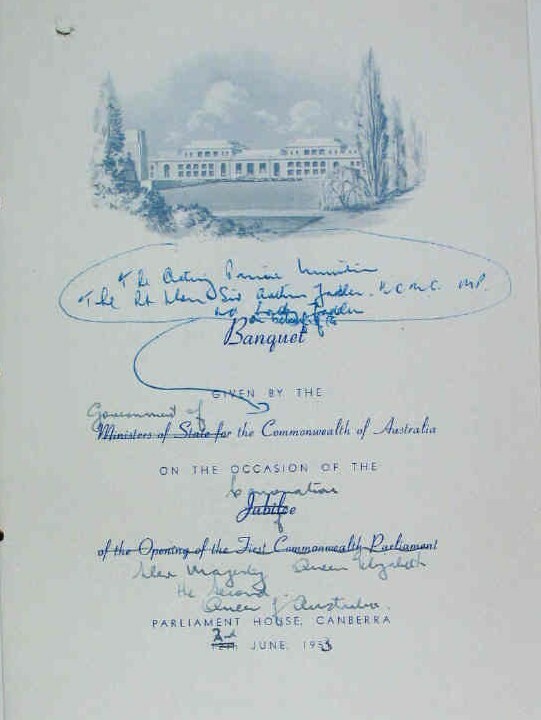 While I haven’t viewed the file that outlines the cost of the dinner itself, a National Archives’ file on the souvenir menu discloses that a special menu for the Coronation Banquet held at Parliament House dinner was printed in Melbourne at the cost of 325 pounds – an expenditure the acting Prime Minister had to have approved by Governor General Sir William Slim. Sir Arthur Fadden may not have had the capacity to approve the expenditure, but he was able to approve the food (and maybe even more importantly) the booze served at the banquet. Food started with ‘Royal Consume’, then continued for another 5 courses before finishing with Chocolate Liqueurs and Coffee. The booze listed alongside is equally generous. Canberra’s politicians and social elite must have rolled away from the table after consuming so much in the name of the new Queen and her Empire! If you’re interested in menus, you might like this project from the New York Public Library to get help from the online public to transcribe their menu collection. This entry was posted in 1950s, ACT, menu and tagged banquet, coronation, food, queen elizabeth. Bookmark the permalink.